Keeping with the holiday spirit, we keep it all in the family with our latest look at love in Guillermo del Toro's CRIMSON PEAK. And while this may not be as romantic as his new release THE SHAPE OF WATER, this film has JESSICA CHASTAIN. Enough said. 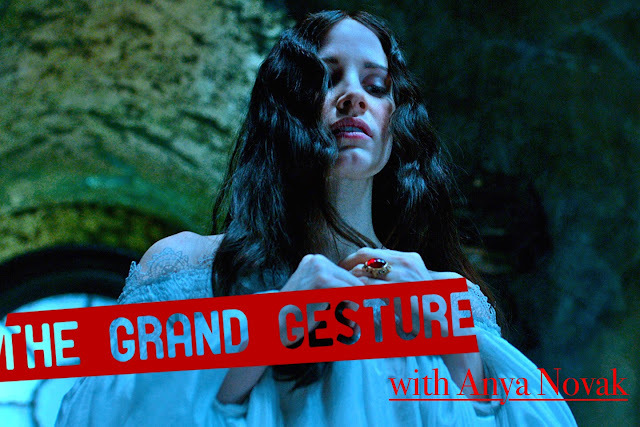 Thankfully we have guest ANYA NOVAK (whose work on genre film you can find EVERYWHERE) to say just a few more words about this great film, such as how important are rough hands in a male suitor? What about TOM HIDDLESTON's quick book reviews? Fun and flirty or just cover for an illiterate mind operating soft hands? And more importantly... do we prefer ghosts or a jealous sister as the third party to our love triangle? Both have pros and cons that we will reveal in our latest episode of THE GRAND GESTURE!